Kotzur Kanvas | You're Local Window Awning and Outdoor Blind Specialist. Auto Arm Awnings are a traditional outdoor window covering that offer light & temperature control. They help to reduce the heat in your home by blocking the sun and UV rays before they hit your window. Auto Arm Awnings also offer protection for the inside of your home from sun damage on furniture, furnishings and floor coverings. Fully adjustable, Window Awnings can be raised or lowered to whatever position you want to suit your shading requirements. Whether that be raised to let the winter sun warmth into the home, or lowered to block out the harsh summer sun and heat entering the home. 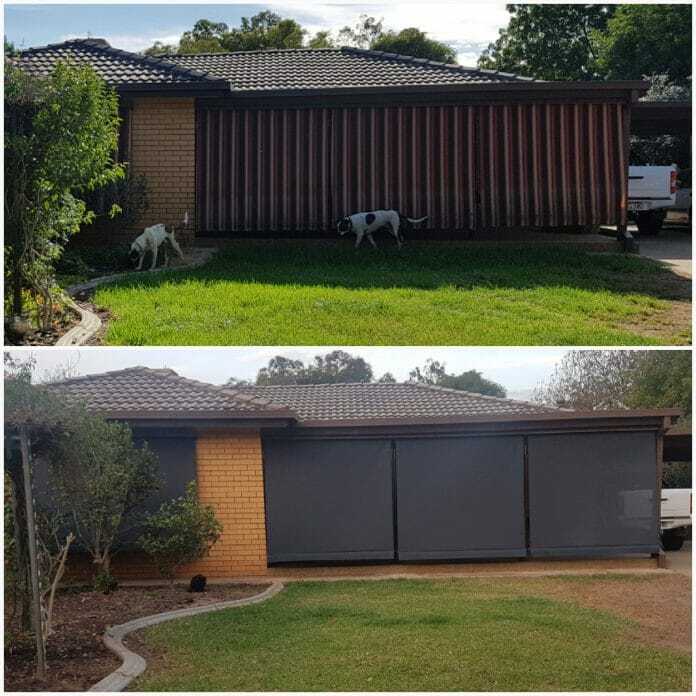 When fully retracted the awnings roll up neatly into a Headbox that can be powder coated to match your existing home colours. Give the office a call on (02) 6925 7805 for more information, or please complete the form at the bottom of this page to arrange your free in home measure and quote. Do you have existing Window Awnings that look a little tired? Kotzur Kanvas can help rejuvenate your currently awnings and kerbside appearance by just replacing the skin/fabric. Due to the high exposure to our harsh Australian sun, the fabrics and stitching on your existing awning can fade or start to deteriorate. If your hardware is in good condition, we offer to replace the skin on your awning. This service is a cost effective option rather than replacing the complete system, as well as an easy way to update the look of your home. Once a new fabric is chosen and we have it in stock we will come and take down, change the skin and put your awnings up within 1-2 day timeframe! Please complete the following to request your Free Measure & Quote with our team.